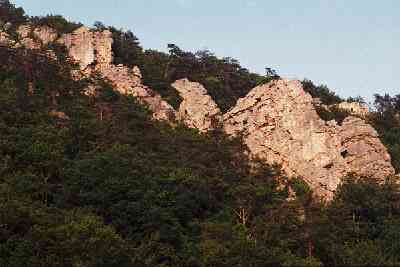 Devil's Racetrack is an obvious rock fin on the east side of US75, between Jelico and Knoxville. If you are a climber, and you have driven by it during daylight, you will have seen it. The nearest town is Jacksboro, which has a pretty fair selection of food and supplies. 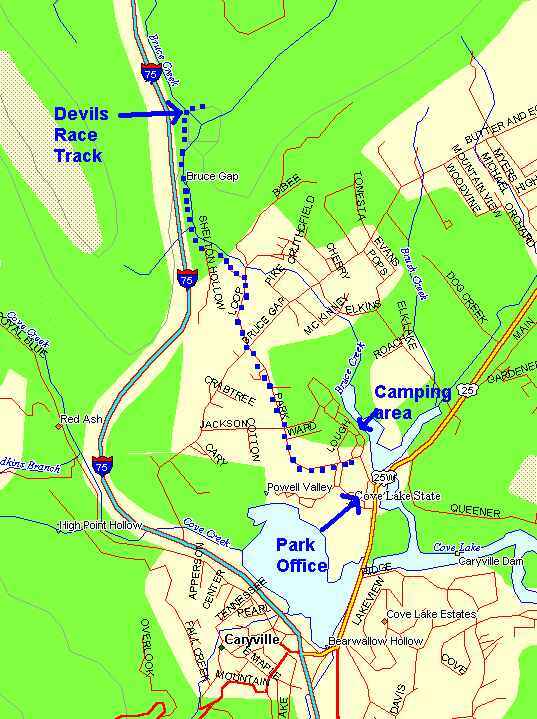 The nearest camping area is Cove Lake State Park. The park is mostly an RV park, so it isn't that scenic, but it has very good facilities. Hookups and picnic tables at every site, showers, swimming pool, tennis courts, etc. Parking access isn't the greatest for this crag. While the walk in is easy, we were warned about car break ins and vandalism. Don't leave anything of value in sight in your car, or even better, don't leave anything of value in your car at all. We didn't have any problems, but but we've only been there twice now. The area has a variety of trad and sport climbs from 5.3-5.9 trad. And from 5.8-5.11 sport. The rock is solid for the most part, and the bolts and rap anchors seem to be well placed. 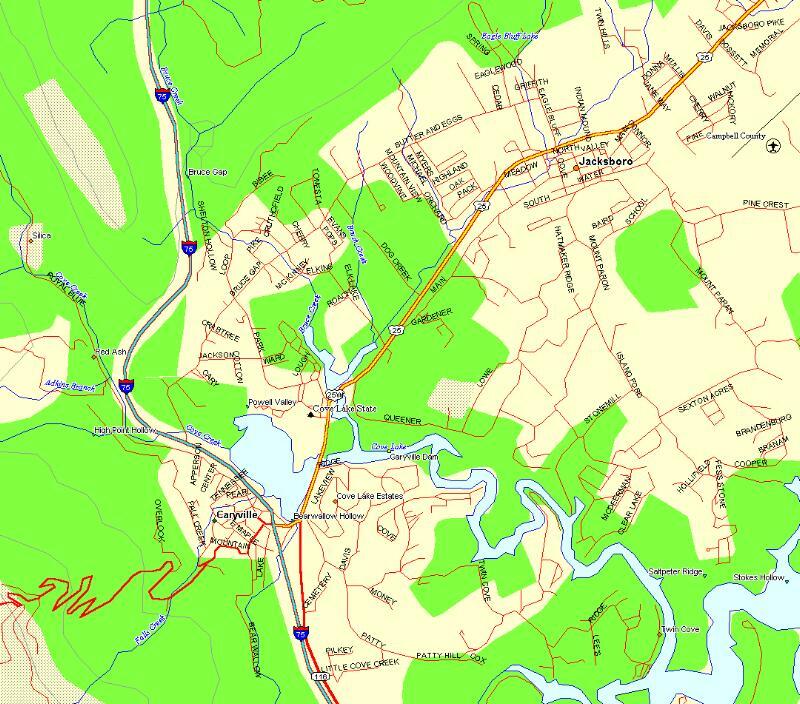 Overview map of local roads. For food and supplies, head north east a couple miles on US25 into Jacksboro. I recommend the local pizza parlor next to the pawn shop, just east of the Wal-Mart. Zoomed in roadmapDotted blue line shows route to the parking area. NOTE: This route guide was copied from the Knox Rocks newsletter, volume 1, issue 2. It is the work of Kenny Cambell and Rusty Deal. I don't know these guys, and have not obtained permission from them to reproduce the information. Information in the following linked page was taken verbatum from their guide sheet, any notes of mine are in italics. In my opinion, the ratings are a little on the soft side, but as always, your mileage will vary. If you know Kenny or Rusty, (or if you ARE Kenny or Rusty), feel free to get in touch with me and I will amend or remove this information if needed. Click here for route information. From the camping area, take a right onto Loop Road. Go past Ward, Jackson, and Bruce Gap roads. Bruce gap has a 4 way stop and is also known as Butter and Eggs Road. Go .35 miles past Butter and Eggs Road, and make a left on a dirt road. The road is just past 319 Loop Road, and is between a run down house with turkeys and chickens in the yard and a fairly nice newer house with a red tin roof. Go .2 miles on the gravel road to the parking area. The parking area is at a bend in the road, where a dirt road is blocked off by large boulders to prevent vehicle access. Walk up the dirt road that parallels the creek for about a half mile. Look for a white trash bag hanging from a tree, and cross the creek and go up hill to the base of the cliffs. Follow the cliff face a couple hundred yards to the left. (north) to get to the jutting rock fins that you can see from the highway. The trash bag landmark really does seem to be the landmark local climbers use to tell when to cross the creek. No lie. The area where you cross the creek is a little wider than the rest of the creek, and has some large boulders in the creek. There is a steep eroded trail that climbs out of the creek. UPDATE: As of April 2001, the white trashbag is no longer in the tree. There is also a no trespassing sign at the parking area by the bolders. Cumberland Trail hiking information. Includes directions to trailheads. Note: the trailhead hiking directions put you on the trail several stenuous miles of hiking away from the start of the climbs. You end up at the top of the climbs and then have to scramble down a gully to the base. It is easier to come in at the bottom as described at the beginning of this page.